Though it might be too early in the season for us to be concerned with the trend of new listings in Tallahassee, we still closely monitor what is going on in the Tallahassee MLS. Thus far in 2014, there have been about 5% fewer homes listed for sale in the Tallahassee MLS when compared to the same period in 2013, and for homes priced above $100,000, the average price is about 5% lower as well. But that is not the most distressing trend. 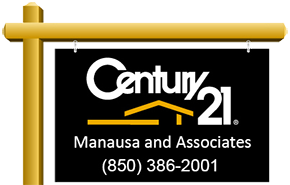 We monitor the homes being listed for sale each day in Tallahassee in order to discover trends as they occur. This first real estate graph shows the thirty day trend of new listings. The green area measures the average sales price while the brown line measures the average percentage of distressed properties to the overall market. 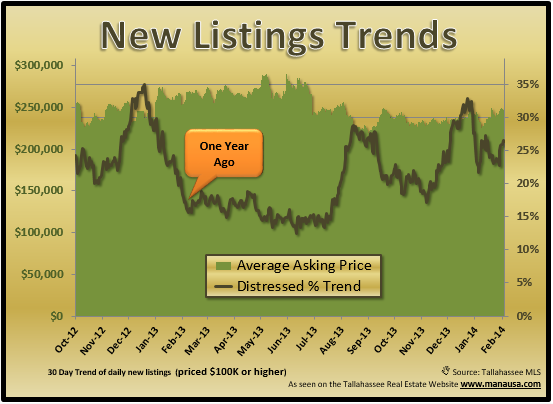 Currently, 26.5% of the listings over the past 30 days were distressed, whereas the same measurement a year ago showed only 17.4% of the listings were distressed. This means that we are currently seeing more short sales and foreclosures entering the market than we saw in the first 6 weeks of 2013. If this trend continues, we very well could see last year's real estate appreciation turn into this year's depreciation. We know there are still thousands of homes in the shadow inventory, the big question is will they be seeping into the market at a faster rate in order for the banks to clear out their remaining pools of non-performing assets? The next real estate graph tracks the average number of homes and the average asking price listed each day, and like the graph above, is a 30 day average. The purple area shows that the current trend reports roughly 8 homes listed each day, and an average asking price of just under $245,000. Remember, this only is measuring the pool of homes where the asking price is $100,000 or more, so the average price for the entire Tallahassee real estate market is significantly lower. As mentioned above, both the unit count and the average asking prices are about 5% lower than at the same time last year. We will keep you posted on new listings in Tallahassee and inventory changes as they occur, so make sure you keep in touch by subscribing to our blog for daily updates.